A semiconductor is a material (commonly a solid chemical element or compound) with distinct electrical properties: in some cases it will conduct electricity, but not in others. Thus, control of electrical current is enabled. A semiconductor’s conductance varies depending on the current or voltage applied to a control electrode, or on the intensity of irradiation by infrared (IR), visible light, ultraviolet (UV), or X rays. Semiconductors can be found at the heart of modern electronics. Some examples include microprocessor chips and transistors, and virtually any device that is computerized or uses radio waves relies on semiconductors. Nowadays, the most commercially important semiconductor is silicon, although many others are also in use. 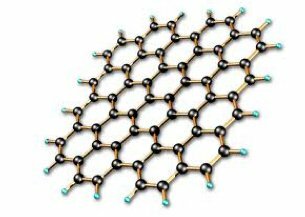 Graphene is a one-atom-thick layer of carbon atoms arranged in a hexagonal lattice. It is the building-block of Graphite (which is used, among others things, in pencil tips), but graphene is a remarkable substance on its own - with a multitude of astonishing properties which repeatedly earn it the title "wonder material". Graphene is the thinnest material known to man at one atom thick, and also incredibly strong - about 200 times stronger than steel. On top of that, graphene is an excellent conductor of heat and electricity and has interesting light absorption abilities. Graphene has potential to revolutionize many applications, among these are solar cells, batteries, sensors and more. Semiconductors are defined by their band gap: the energy required to excite an electron stuck in the valence band, where it cannot conduct electricity, to the conduction band, where it can. The band gap needs to be large enough so that there is a clear contrast between a transistor’s on and off states, and so that it can process information without generating errors. Among graphene's superlative properties is exceptional electrical conductivity. This property makes the material attractive for many applications, but it is problematic for use as a semiconductor. For that, graphene would need a bandgap (which it normally lacks), or in other words to behave not just as a conductor but to also have an insulator mode. Scientists have found various methods to introduce a bandgap to graphene. By fabricating graphene in specific shapes (like ribbons), by using certain growth methods paired with specific materials, by using graphene's morphological structure (namely wrinkles), by doping the material and more. Other 2D materials can be used instead or together with graphene, that have an inherent bandgap. 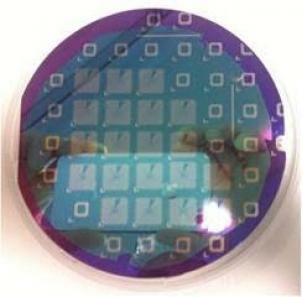 These materials may prove to be an easier path towards next-gen semiconductor based devices. Researchers at Columbia Engineering, working with colleagues from Princeton and Purdue Universities and Istituto Italiano di Tecnologia, have engineered "artificial graphene" by recreating, for the first time, the electronic structure of graphene in a semiconductor device. Etched pillars define the positions of quantum dots (red puddles) arranged in an hexagonal lattice. When the spacing between the quantum dots is sufficiently small, electrons can move between them. Graphene comes in one atomic arrangement: the positions of the atoms in the graphene lattice are fixed, and so all experiments on graphene must adapt to those constraints. On the other hand, in artificial graphene the lattice can be engineered over a wide range of spacings and configurations, making it convenient for condensed researchers because it will have more versatile properties than the natural material. Researchers at MIT have developed a technique that uses graphene as a kind of “copy machine”, to transfer intricate crystalline patterns from an underlying semiconductor wafer to a top layer of identical material. As a great deal of money is spent in the semiconductor industry on wafers that serve as the substrates for microelectronics components, which can be turned into transistors, light-emitting diodes etc., this method may help reduce the cost of wafer technology and enable devices made from more exotic, higher-performing semiconductor materials than conventional silicon. Last month we asked several graphene experts about their thoughts on the commercial potential of CVD as a graphene production process. This interesting discussion led to my talk with Jesus de la Fuente, Graphenea's Founder & CEO. Graphenea is one of the world's leaders in CVD graphene, and Jesus kindly agreed to update us on his thoughts on CVD and the recent advances made at Graphenea. A team of researchers from China and Japan has designed a new method to make minuscule ribbons of graphene that are highly sought-after building blocks for semiconductor devices thanks to their predicted electronic properties. These structures, however, have proven challenging to make. Previous attempts at making graphene nanoribbons relied on placing sheets of graphene over a layer of silica and using atomic hydrogen to etch strips with zigzag edges, a process known as anisotropic etching. This method, however, only worked well to make ribbons that had two or more graphene layers. Irregularities in silica created by electronic peaks and valleys roughen its surface, so creating precise zigzag edges on graphene monolayers was a challenge. Aixtron, a leading provider of deposition equipment, is working together with five partners in the “HEA2D” project to investigate the production, qualities, and applications of 2D nanomaterials. The joint project is now researching an end-to-end processing chain consisting of various deposition processes for 2D materials, processes for transfer onto plastic foils, and mass integration into plastics components. AIXTRON’s partners for implementing systems technology and integrating materials into plastic molded parts are the Fraunhofer Institute for Production Technology (IPT), Coatema Coating Machinery, and Kunststoff-Institut Lüdenscheid (K.I.M.W.). This work is being supported in terms of nano-analytics and the development of prototype components by the Institutes of “Electronic Materials and Nanostructures” (University of Duisburg-Essen) and “Graphene-based Nanotechnology” (University of Siegen).